Yoga for Scoliosis - Is it good or bad? "Yoga was not conceived for scoliosis, as our exercises were." "Many problems that my mother Katharina Schroth and I saw in some of our patients stemmed from well-meaning but counterproductive therapeutic exercise programs that used to be practiced in Germany. In some cases our patients had performed bad exercises for years before coming to our clinic, and their condition was far worse, and more difficult and time-consuming to correct, than if they had done no exercises at all. Therefore I note with great concern that many of these exercises are now very popular in yoga, and some are even recommended by yoga teachers as scoliosis exercises. While they are often very positive for normal bodies, we found the exercises on this page -- or similar ones -- to be harmful to our scoliosis patients. 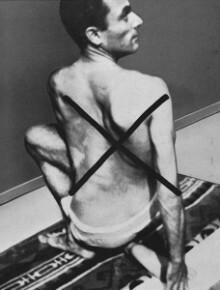 Yoga was not conceived for scoliosis, as our exercises were. 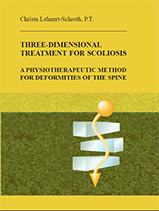 Each Schroth scoliosis exercise was created empirically in our clinic to address a specific problem that our patients had. The complex musculoskeletal configuration of every case of scoliosis made it necessary to consider and observe carefully all the potential ramifications of each exercise, so that each would both achieve its intended effect and create no unwanted secondary problems. It is very important not simply to do a series of exercises, but to accomplish a specific, rehabilitative goal with each exercise. Section C.VIII.1 of my book is devoted to pointing out exercises that must be avoided by persons with scoliosis. Some of these exercises are outlined here. 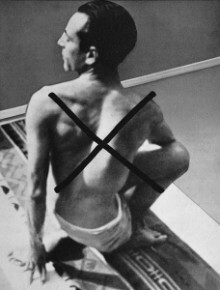 Bending a scoliotic back towards the rear is strictly forbidden from all starting positions, since it will increase both lumbar and thoracic lordosis. Back-bend positions increase lumbar lordosis and the anterior lumbar wedge, without simultaneously diminishing the rib hump. Cobra - Bhujangasana or Naga-asana The cobra works into the lordosis, contracting the lumbar spine, although the head is brought backwards. The neck is bent here, whereas Schroth does not bend the neck backwards, but rather shifts the head and neck rearwards in upright position. The cobra also overstretches abdominal muscles. The problems are the same as with the cobra -- increasing lordosis and bending the neck. The only difference is the standing position. This exercise increases lumbar lordosis. It is bad for scoliosis. The same problem again: overstretching the abdominal muscles, promoting lumbar lordosis, neck bent too far. The carotid artery is constricted. See warnings above for the bow, camel, cobra, and half moon. The important principles are the same. Bending backwards increases lordosis abnormally. This exercises increases lumbar lordosis. It could potentially be useful for lumbar kyphosis, but would have to be tested. The King of the Dance is excellent for a normal body but not for scoliosis. It would be inappropriate whether performed either left or right. When the leg on the rib hump side is lifted backwards, it would be good in order to strengthen the lumbar muscles. However, the leg is raised too high, so that these lumbar muscles contract, instead of being required to bear weight, as for example in the Schroth Muscle Cylinder exercise. This pose is very eccentric, but interesting for normal bodies. Not recommended for scoliosis. In yoga the sun salutation is normally performed alternately with several other exercises, so that a wrong movement is cancelled by a better one. It is good for normal bodies, and is a fun exercise to do. However, for scoliosis we need to concentrate on our goal. The central segment, the rib hump, is enlarged as it rotates backwards into the existing curvature, regardless of whether the rotation is to the left or right side. This exercise is excellent for straight, normal backs. In it, the internal organs are squeezed, that is, freed of waste. However, people with scoliosis should absolutely avoid the Spinal Twist. A scoliotic body usually has three or four contortions (counter-rotations) between the pelvis, rib cage, and shoulder girdle. These are exacerbated by twisting the shoulder girdle against the pelvic girdle while the middle section, the rib cage, is ignored. That middle section is precisely where the prominent rib hump is located, and on the other side the rib valley. Whether the torso is twisted left or right, the rib hump and the rib valley will increase. If you twist so far that you can hear your spine crack, that is a sign that the spinal rib joints are moving further into an abnormally twisted state. It does no good to do this movement once to the right and once to the left: it is counterproductive in both cases. 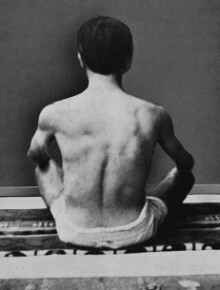 The same patient performs a spinal twist to the right, similar to Ardha Matsyendrasana. The torso twisting exercise exaggerates his rib hump dramatically. The rib hump is very pronounced when twisting in either direction. This would worsen the existing scoliotic form of the spine. Trying to open up the main scoliotic curve between the thoracic and lumbar spine will push the upper trunk in the same direction that is due to the lumbar curvature. The caudal part of the thoracic curve goes in the same direction as the cranial part of the lumbar curve. Thus, the two spinal curves lead into one another and form one line which has an oblique direction to the right. This is similar to one of the counterproductive Swedish untwisting exercises we used to see. 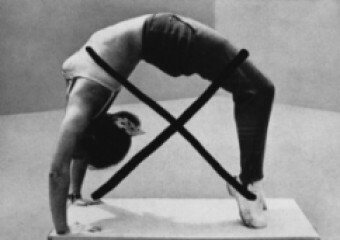 A scoliosis patient performing this exercise would exercise into the existing curve and increase it. It is not recommended even if subsequently done in the opposite direction. The pure reversal of a cranial curve is ineffective or wrong if the caudal curve is enlarged in the process. Movements to the side must never be bending movements: the body must be inclined but always held straight, starting at the hip in combination with guided rotational angular breathing. To be completely avoided in scoliosis, because here the shoulder girdle is twisted against the pelvic girdle and the middle section (which thereby creates a rib hump) must follow after the more comfortable side. The head in the shoulder stand pose is sharply bent forward, which overstretches the neck muscles. It will also promote cervical kyphosis. Moreover, the whole body weight lies on the shoulders, and would enormously increase a rib hump formation. Instead of bending the head, Schroth not only brings the head over the center of the body (in standing position), but also a bit backwards. Therefore Schroth scoliosis exercises do the complete opposite of this one. 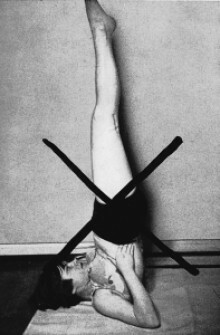 Effect is similar to the shoulder stand. Undesirable for scoliosis. The head stand is not useful for scoliosis."